A vacuum is a volume of space that is essentially empty of matter, so that gaseous pressure is much less than standard atmospheric pressure. The root of the word vacuum is the Latin adjective vacuus which means "empty," but space can never be perfectly empty. A perfect vacuum with a gaseous pressure of absolute zero is a philosophical concept that is never observed in practice, and quantum theory predicts that no volume of space is perfectly empty in this way. Physicists often use the term "vacuum" slightly differently. They discuss ideal test results that would be expected to occur in a perfect vacuum, which they simply call "vacuum" or "free space," and they use the term partial vacuum to refer to the imperfect vacua realized in practice. The quality of a vacuum is measured by how closely it approaches a perfect vacuum. The residual gas pressure is the primary indicator of quality, and it is most commonly measured in units of torr, even in metric contexts. Lower pressures indicate higher quality, although other variables must also be taken into account. Quantum mechanics sets limits on the best possible quality of vacuum. Outer space is a natural high-quality vacuum, mostly of much higher quality than what can be created artificially with current technology. Low-quality, artificial vacuums have been used for suction for millennia. 11 Alternative meanings of "vacuum"
Vacuum has been a common topic of philosophical debate since ancient Greek times, but it was not studied empirically until the seventeenth century. Experimental techniques were developed following Evangelista Torricelli's theories of atmospheric pressure. Vacuum became a valuable industrial tool in the twentieth century, with the introduction of the light bulb and vacuum tube, and a wide array of vacuum technology has since become available. The recent development of human spaceflight has raised interest in the impact of vacuum on human health, and life forms in general. Vacuum is useful in a variety of processes and devices. 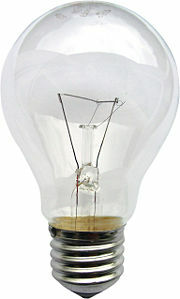 Its first common use was in incandescent light bulbs to protect the tungsten filament from chemical degradation. Its chemical inertness is also useful for electron beam welding, for chemical vapor deposition and dry etching in semiconductor fabrication and optical coating fabrication, for cold welding, and for vacuum packing. The reduction of convection improves the thermal insulation of thermos bottles and double-paned windows. Deep vacuum promotes outgassing which is used in freeze drying, adhesive preparation, distillation, metallurgy, and process purging. The electrical properties of vacuum make electron microscopes and vacuum tubes possible, including cathode ray tubes. The removal of air friction is useful for flywheel energy storage and ultracentrifuges. Suction is used for a very wide variety of applications. The Newcomen steam engine used vacuum instead of pressure to drive a piston. In the nineteenth century, vacuum was used for traction on Isambard Kingdom Brunel's experimental atmospheric railway. Much of outer space has the density and pressure of an almost perfect vacuum. It has effectively no friction, which allows stars, planets and moons to move freely along ideal gravitational trajectories. But no vacuum is perfect, not even in interstellar space, where there are a few hydrogen atoms per cubic centimeter at 10 fPa (10−16 Torr). The deep vacuum of space could make it an attractive environment for certain processes, for instance those that require ultraclean surfaces, but for small scale applications it is much easier to create an equivalent vacuum on Earth than to leave the Earth's gravity well. Stars, planets and moons keep their atmosphere by gravitational attraction, so atmospheres have no clearly delineated boundary. The density of atmospheric gas simply decreases with distance from the object. In Low Earth orbit (about 300 kilometers altitude) the atmospheric density is about 100 nPa (10-9 Torr), still sufficient to produce significant drag on satellites. Most artificial satellites operate in this region, and they need to fire their engines every few days to maintain orbit. Beyond planetary atmospheres, the pressure from photons and other particles from the sun become significant. Spacecraft can be buffeted by solar winds, but planets are too massive to be affected. The idea of using this wind with a solar sail has been proposed for interplanetary travel. All of the observable universe is filled with large numbers of photons, the so-called cosmic background radiation, and quite likely a correspondingly large number of neutrinos. The current temperature of this radiation is about 3 K, or -270 degrees Celsius. It seems to be a natural consequence of our points of view to assume that the whole of space is filled with electrons and flying electric ions of all kinds. We have assumed that each stellar system in evolutions throws off electric corpuscles into space. It does not seem unreasonable therefore to think that the greater part of the material masses in the universe is found, not in the solar systems or nebulae, but in "empty" space. Vacuum is primarily an asphyxiant. Humans exposed to vacuum will lose consciousness after a few seconds and will die within minutes, but the symptoms are not nearly as graphic as commonly shown in pop culture. Robert Boyle (1627-1691) was the first to show that vacuum was lethal to small animals. Blood and other body fluids do boil (the medical term for this condition is known as ebullism) and the vapor pressure may be expected to bloat the body to twice its normal size and slow down circulation, but tissues are elastic and porous enough to prevent rupture. Ebullism is slowed by the pressure containment of blood vessels, so some blood remains liquid. Swelling and ebullism can be reduced by containment in a flight suit. Space shuttle astronauts wear a fitted elastic garment called the Crew Altitude Protection Suit (CAPS) which prevents ebullism at vacuums of 15 Torr (2 kPa). However, even if ebullism is prevented, simple evaporation can cause the bends and gas embolisms. Rapid evaporation cooling of the skin will create frost, particularly in the mouth, but this is not a significant hazard. Animal experiments show that rapid complete recovery is the norm for exposures of less than 90 seconds, while longer full body exposures are fatal and resuscitation has never succeeded. There are limited data available from human accidents, but they are consistent with animal data. Limbs may be exposed for much longer if breathing is not impaired. Rapid decompression can be much more dangerous than the vacuum exposure. If the victim holds his breath during decompression, the delicate internal structures of the lungs can be ruptured, causing death. Eardrums may be ruptured by rapid decompression, soft tissues may bruise and seep blood, and the stress of surprise will accelerate oxygen consumption leading to asphyxiation. During World War II, the Nazi regime tortured concentration camp prisoners by exposing them to simulated high altitude conditions in experiments conducted on prisoners. Some extremophile microorganisms can survive vacuum for a period of years, as can the Tardigrade. Historically, there has been much dispute over whether such a thing as a vacuum can exist. Ancient Greek philosophers did not like to admit the existence of a vacuum, asking themselves "how can 'nothing' be something?" Plato (427-347 B.C.E.) found the idea of a vacuum inconceivable. He believed that all physical things were instantiations of an abstract Platonic ideal, and could not imagine an "ideal" form of a vacuum. Similarly, Aristotle (384-322 B.C.E.) considered the creation of a vacuum impossible—nothing could not be something. Later Greek philosophers thought that a vacuum could exist outside the cosmos, but not inside it. The Islamic philosopher Al-Farabi (850-970 B.C.E.) appears to have carried out the first recorded experiments concerning the existence of the vacuum whereby he investegated handheld plungers in water. In the Middle Ages, some Christians held the idea of a vacuum to be immoral or even heretical. The absence of anything implied the absence of God, and hearkened back to the void prior to the story of creation in the book of Genesis. Medieval thought experiments into the idea of a vacuum considered whether a vacuum was present, if only for an instant, between two flat plates when they were rapidly separated. There was much discussion of whether the air moved in quickly enough as the plates were separated, or, following Walter Burley, whether a 'celestial agent' prevented the vacuum arising—that is, whether nature abhorred a vacuum. This speculation was shut down by the 1277 Paris condemnation of Bishop Etienne Tempier, which required there to be no restrictions on the powers of God, which led to the conclusion that God could create a vacuum if he so wished. Opposition to the idea of a vacuum existing in nature continued into the Scientific Revolution, with scholars such as Paolo Casati taking an anti-vacuist position. Following work by Galileo, Evangelista Torricelli argued in 1643 that there was a vacuum at the top of a mercury barometer. In 1654, Otto von Guericke conducted his famous Magdeburg hemispheres experiment, showing that teams of horses could not separate two hemispheres from which the air had been evacuated. The study of vacuum then lapsed until 1855 when Heinrich Geissler invented the mercury displacement pump and achieved a record vacuum of about 10 Pa (0.1 Torr). 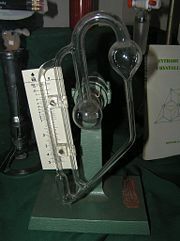 A number of electrical properties become observable at this vacuum level, and led to the development of the vacuum tube. In 1887 the Michelson-Morley experiment, using an interferometer to attempt to detect the change in the speed of light caused by the Earth moving with respect to the aether, was a famous null result, showing that there really was no static, pervasive medium throughout space and through which the Earth moved as though through a wind. While there is then no aether, and no such entity is required for the propagation of light, space between the stars is not completely empty. Besides various particles making up the cosmic radiation, there is a cosmic background of photon radiation (light), including the thermal background at about 2.7 K, seen as a relic of the so-called Big Bang. None of these presences affect the outcome of the Michelson-Morley experiment to any significant degree. Albert Einstein (1879-1955) argued that physical objects are not located in space, but rather have a spatial extent. Seen this way, the concept of empty space loses its meaning. Rather, space is an abstraction, based on the relationships between local objects. Nevertheless, the general theory of relativity admits a pervasive gravitational field, which in Einstein's own words it is possible to regard as an "aether," with properties that vary from one location to another. Only, one must take care not to ascribe to it material properties like velocity, and so on. In 1930 Paul Dirac proposed a model of vacuum as an infinite sea of particles possessing negative energy, called the Dirac sea. This theory helped refine the predictions of his earlier formulated Dirac equation and successfully predicted the existence of the positron, which was discovered two years later in 1932. Despite this early success, the idea was soon abandoned in favor of the more elegant quantum field theory. The development of quantum mechanics has complicated the modern interpretation of vacuum by requiring indeterminacy. Niels Bohr (1885-1962) and Werner Heisenberg's uncertainty principle and Copenhagen interpretation, formulated in 1927, predict a fundamental uncertainty in the position of any particle, which, not unlike the gravitational field, questions the emptiness of space between particles. In the late twentieth century, this principle was understood to also predict a fundamental uncertainty in the number of particles in a region of space, which means that it cannot be stated absolutely for sure that a certain region of space contains zero particles. Ironically, Plato was right, if only by chance. Even an ideal vacuum, in practice—thought of as the complete absence of anything—will not remain empty. One reason is that the walls of a vacuum chamber emit light in the form of black-body radiation: visible light if they are at a temperature of thousands of degrees, infrared light if they are cooler. If this soup of photons is in thermodynamic equilibrium with the walls, it can be said to have a particular temperature, as well as a pressure. Another reason that perfect vacuum is impossible is the Heisenberg uncertainty principle which states that no particle can ever have an exact position. Each atom exists as a probability function of space, which has a certain non-zero value everywhere in a given volume. Even the space between molecules is not a perfect vacuum. More fundamentally, quantum mechanics predicts that vacuum energy can never be exactly zero. The lowest possible energy state is called the zero-point energy and consists of a seething mass of virtual particles that have brief existence. This is called vacuum fluctuation. While most agree that this represents a significant part of particle physics, it is a concept that would benefit from a deeper understanding than currently available. Vacuum fluctuations may also be related to the so-called cosmological constant in the theory of gravitation, if indeed this entity were to be observed in nature on a macroscopic scale. The best evidence for vacuum fluctuations is the Casimir effect and the Lamb shift. In quantum field theory and string theory, the term "vacuum" is used to represent the state with the lowest possible energy. In free (non-interacting) quantum field theories, this state is analogous to the ground state of a quantum harmonic oscillator. If the theory is obtained by quantization of a classical theory, each stationary point of the energy in the configuration space gives rise to a single vacuum. String theory is believed to be analogous to quantum field theory but one with a huge number of vacua—with the so-called anthropic landscape. The manual water pump draws water up from a well by creating a vacuum that water rushes in to fill. In a sense, it acts to evacuate the well, although the high leakage rate of dirt prevents a high quality vacuum from being maintained for any length of time. Fluids cannot be pulled, so it is technically impossible to create a vacuum by suction. Suction is the movement of fluids into a vacuum under the effect of a higher external pressure, but the vacuum has to be created first. The easiest way to create an artificial vacuum is to expand the volume of a container. For example, the diaphragm muscle expands the chest cavity, which causes the volume of the lungs to increase. This expansion reduces the pressure and creates a partial vacuum, which is soon filled by air pushed in by atmospheric pressure. To continue evacuating a chamber indefinitely without requiring infinite growth, a compartment of the vacuum can be repeatedly closed off, exhausted, and expanded again. This is the principle behind positive displacement pumps, like the manual water pump for example. Inside the pump, a mechanism expands a small sealed cavity to create a deep vacuum. Because of the pressure differential, some fluid from the chamber (or the well, in our example) is pushed into the pump's small cavity. The pump's cavity is then sealed from the chamber, opened to the atmosphere, and squeezed back to a minute size. 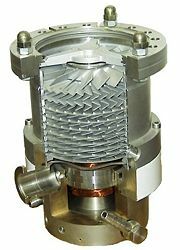 Many variations of the positive displacement pump have been developed, and many other pump designs rely on fundamentally different principles. Momentum transfer pumps, which bear some similarities to dynamic pumps used at higher pressures, can achieve much higher quality vacuums than positive displacement pumps. Entrapment pumps can capture gases in a solid or absorbed state, often with no moving parts, no seals and no vibration. None of these pumps are universal; each type has important performance limitations. They all share a difficulty in pumping low molecular weight gases, especially hydrogen, helium, and neon. In ultra high vacuum systems, some very odd leakage paths and outgassing sources must be considered and some oils and greases will boil off in extreme vacuums. The porosity of the metallic chamber walls may have to be considered. The lowest pressures currently achievable in laboratory are about 10-13 Torr. Evaporation and sublimation into a vacuum is called outgassing. All solids and liquids have a small vapor pressure, and their outgassing becomes important when the pressure of their surroundings falls below this vapor pressure. In man-made systems, outgassing has the same effect as a leak and can limit the achievable vacuum. Outgassing products may condense on nearby colder surfaces, which can be troublesome if they obscure optical instruments or react with other materials. This is of great concern to space missions, where an obscured telescope or solar cell can ruin an expensive mission. The most prevalent outgassing product in man-made vacuum systems is water absorbed by chamber materials. It can be reduced by desiccating or baking the chamber, and removing absorbent materials. Outgassed water can condense in the oil of rotary vane pumps and reduce their net speed drastically if gas ballasting is not used. High vacuum systems must be clean and free of organic matter to minimize outgassing. Ultra-high vacuum systems are usually baked, preferably under vacuum, to temporarily raise the vapor pressure of all outgassing materials in the system and boil them off. Once the bulk of the outgassing materials are boiled off and evacuated, the system may be cooled to lower vapor pressures and minimize residual outgassing during actual operation. Some systems are cooled well below room temperature by liquid nitrogen to shut down residual outgassing and simultaneously cryopump the system. The quality of a vacuum is indicated by the amount of matter remaining in the system. Vacuum is primarily measured by its absolute pressure, but a complete characterization requires further parameters, such as temperature and chemical composition. One of the most important parameters is the mean free path (MFP) of residual gases, which indicates the average distance that molecules will travel between collisions with each other. As the gas density decreases, the MFP increases, and when the MFP is longer than the chamber, pump, spacecraft, or other objects present, the continuum assumptions of fluid mechanics do not apply. This vacuum state is called high vacuum, and the study of fluid flows in this regime is called particle gas dynamics. The MFP of air at atmospheric pressure is very short, 70 nanometers, but at 100 mPa (~1×10-3 Torr) the MFP of room temperature air is roughly 100 millimeters, which is on the order of everyday objects such as vacuum tubes. The Crookes radiometer turns when the MFP is larger than the size of the vanes. Deep space is generally much emptier than any artificial vacuum that can be created in a laboratory, although many laboratories can reach lower vacuum than that of low earth orbit. In interplanetary and interstellar space, isotropic gas pressure is insignificant when compared to solar pressure, solar wind, and dynamic pressure, so the definition of pressure becomes difficult to interpret. Astrophysicists prefer to use number density to describe these environments, in units of particles per cubic centimeter. The average density of interstellar gas is about one atom per cubic centimeter. Medium vacuum is vacuum that can be achieved with a single pump, but is too low to measure with a liquid or mechanical manometer. It can be measured with a McLeod gauge, thermal gauge or a capacitive gauge. 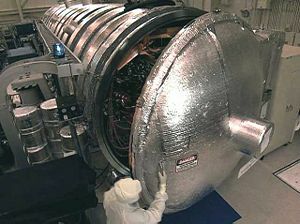 Ultra high vacuum requires baking the chamber to remove trace gases, and other special procedures. Deep space is generally much more empty than any artificial vacuum that we can create. Perfect vacuum is an ideal state that cannot be obtained in a laboratory, nor even in outer space. Vacuum is measured in units of pressure. The SI unit of pressure is the pascal (abbreviation Pa), but vacuum is usually measured in torrs. A torr is equal to the displacement of a millimeter of mercury (mmHg) in a manometer, with 1 torr equaling 133.3223684 pascals above absolute zero pressure. Vacuum is often also measured using micrometers of mercury, the barometric scale, or as a percentage of atmospheric pressure in bars or atmospheres. Low vacuum is often measured in inches of mercury (inHg) below atmospheric. "Below atmospheric" means that the absolute pressure is equal to the atmospheric pressure (29.92 inHg) minus the vacuum pressure in inches of mercury. Thus a vacuum of 26 inHg is equivalent to an absolute pressure of (29.92-26) or 4 inHg. 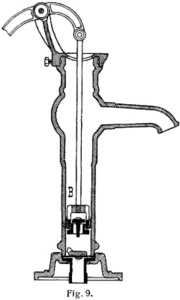 Hydrostatic gauges (such as the mercury column manometer) consist of a vertical column of liquid in a tube whose ends are exposed to different pressures. The column will rise or fall until its weight is in equilibrium with the pressure differential between the two ends of the tube. The simplest design is a closed-end U-shaped tube, one side of which is connected to the region of interest. Any fluid can be used, but mercury is preferred for its high density and low vapor pressure. Simple hydrostatic gauges can measure pressures ranging from 1 torr (100 Pa) to above atmospheric. An important variation is the McLeod gauge which isolates a known volume of vacuum and compresses it to multiply the height variation of the liquid column. The McLeod gauge can measure vacuums as high as 10−6 torr (0.1 mPa), which is the lowest direct measurement of pressure that is possible with current technology. Other vacuum gauges can measure lower pressures, but only indirectly by measurement of other pressure-controlled properties. These indirect measurements must be calibrated to SI units via a direct measurement, most commonly a McLeod gauge. Mechanical or elastic gauges depend on a Bourdon tube, diaphragm, or capsule, usually made of metal, which will change shape in response to the pressure of the region in question. A variation on this idea is the capacitance manometer, in which the diaphragm makes up a part of a capacitor. A change in pressure leads to the flexure of the diaphragm, which results in a change in capacitance. These gauges are effective from 10−3 torr to 10−4 torr. Ion gauges are used in ultrahigh vacua. They come in two types: hot cathode and cold cathode. In the hot cathode version an electrically heated filament produces an electron beam. The electrons travel through the gauge and ionize gas molecules around them. The resulting ions are collected at a negative electrode. The current depends on the number of ions, which depends on the pressure in the gauge. Hot cathode gauges are accurate from 10−3 torr to 10−10 torr. The principle behind cold cathode version is the same, except that electrons are produced in a discharge created by a high voltage electrical discharge. Cold Cathode gauges are accurate from 10−2 torr to 10−9 torr. Ionization gauge calibration is very sensitive to construction geometry, chemical composition of gases being measured, corrosion and surface deposits. Their calibration can be invalidated by activation at atmospheric pressure or low vacuum. The composition of gases at high vacuums will usually be unpredictable, so a mass spectrometer must be used in conjunction with the ionization gauge for accurate measurement. The speed of light approaches 299,792,458 m/s, but is always slower. Index of refraction approaches 1.0, but is always higher. Electric permittivity ( ) approaches 8.8541878176x10-12 farads per meter (F/m). Magnetic permeability (μ0) approaches 4π×10−7 N/A2. 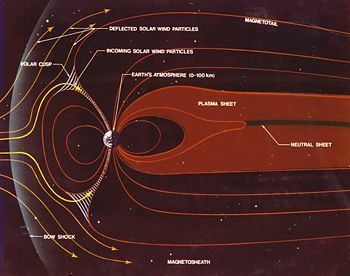 Characteristic impedance ( ) approaches 376.73 Ω.
free space, a concept of electromagnetic theory, corresponding to a theoretical "perfect vacuum"
↑ (1913) "Polar Magnetic Phenomena and Terrella Experiments", The Norwegian Aurora Polaris Expedition 1902-1903, 720. ↑ Billings, Charles E. (1973). "Barometric Pressure", in edited by James F. Parker and Vita R. West: Bioastronautics Data Book, 2nd ed., NASA. NASA SP-3006. ↑ Human Exposure to Vacuum. Retrieved July 10, 2007. ↑ Webb, P. (1968). The Space Activity Suit: An Elastic Leotard for Extravehicular Activity. Aerospace Medicine 39: 376–383. ↑ J. P. Cooke and R. W. Bancroft, "Some Cardiovascular Responses in Anesthetized Dogs During Repeated Decompressions to a Near-Vacuum" Aerospace Medicine 37 (1966): 1148–1152. ↑ Czarnik, Tamarack R.. Ebullism at 1 million feet: Surviving Rapid/Explosive Decompression. Retrieved July 10, 2007. ↑ “Arabic and Islamic Natural Philosophy and Natural Science,” Stanford Encyclopedia of Philosophy. Retrieved July 10, 2007. ↑ 9.0 9.1 Barrow, John D. (2000). The Book of Nothing: Vacuums, Voids, and the Latest Ideas about the Origins of the Universe, 1st American Ed., New York: Pantheon Books. ISBN 0099288451. ↑ R. H. Patterson, Ess. Hist. & Art 10 (1862). ↑ William Crookes, "Chemical Gazette," The Chemical News and Journal of Industrial Science (1932). ↑ W. H. Pickering (1912), “The Motion of the Solar System Relatively to the Interstellar Absorbing Medium,” Monthly Notices of the Royal Astronomical Society 72: 740. ↑ Albert Einstein, Naturwissenschaften 6: 697-702. ↑ Ishimaru, H (1989). Ultimate Pressure of the Order of 10-13 Torr in an Aluminum Alloy Vacuum Chamber. J. Vac. Sci. Technol. 7 (3-II): 2439–2442. ↑ University of New Hampshire Experimental Space Plasma Group. What is the Interstellar Medium. The Interstellar Medium, An Online Tutorial. Retrieved July 10, 2007. ↑ American Vacuum Society. Glossary. AVS Reference Guide. Retrieved July 10, 2007. ↑ National Physical Laboratory, UK. FAQ on Pressure and Vacuum. Retrieved July 10, 2007. ↑ John H. Moore, Christopher Davis, Michael A. Coplan and Sandra Greer, Building Scientific Apparatus (Boulder, CO: Westview Press, 2002, ISBN 0813340071). ↑ Beckwith, Thomas G. and Roy D. Marangoni and John H. Lienhard V (1993). "Measurement of Low Pressures", Mechanical Measurements, 5th ed., Reading, M.A. : Addison-Wesley, 591-595. ISBN 0201569477. ↑ "Vacuum Techniques". The Encyclopedia of Physics (3rd ed. ): pp. 1278-1284. (1990). Ed. Robert M. Besançon. New York: Van Nostrand Reinhold,. ISBN 0442005229. Czarnik, Tamarack R. 1999. Ebullism at 1 Million Feet: Surviving Rapid/Exposive Decompression. Landis, Geoffrey A. 2001. Human Exposure to Vacuum. University of New Hampshire Experimental Space Plasma Group. What is Interstellar Medium? The Interstellar Medium, An Online Tutorial. This page was last modified on 13 January 2016, at 16:53.